While it may sometimes seem as though a construction site superintendent does everything on site including washing out the coffee pot and turning out the lights, it isn't quite that bad. But he or she does have a number of duties, which usually includes making out or at least overseeing the submission of daily reports. By now, even if they aren't paper pushers, most in the construction industry are aware that software exists to both allow a wide variety of daily reports to be done digitally, and to be done on a variety of mobile devices. For a busy general contractor, this does make daily reporting both easier and quicker, if not more enjoyable. But one perk of doing reports in this manner is that a daily log here can be customized. Such report files might not win awards for artistic creativity, but a customized daily report template digitally created and stored has multiple benefits. It means that in a superintendent's absence, another filer can find, update, and submit reports, making sure that a project stays on schedule. Accessible templates also mean that reports are filed consistently and accurately, always important since these reports have weight as legal documents. And a construction daily report may be viewed, edited, and commented on by any number of people, including shareholders, so a customized daily construction report template should be easily recognizable, and not so “customized” that it’s unprofessional looking. The essential function of a daily report is to chronicle the various activities that affect a project, ranging from presence of workers, to weather conditions, to deliveries, to work progress. Assume that at a minimum, your report will include daily updates on this. 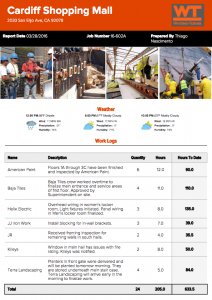 Since this is a digital construction daily log template, and on the internet showing means as much as telling, assume that this template will need to include fields for photos and graphics as well. So now that you know what you want this daily report to contain, how do you achieve it? By purchasing construction software like Raken for daily reporting, contractors are getting an application compatible with the most commonly used systems, that allows superintendents to create a multi-page template for everything from manpower hours to notes within minutes, that can be accessed by users within seconds. So while daily reports may never be fun, with software like Raken, it will be fast, efficient, professional, and easily accessible to all appropriate parties. Want to learn more? See our daily report example.